An important part of the THI/CARS project is training and education. A Training Plan has been produced and Telford College, now Edinburgh College , Granton Road Campus in Edinburgh was appointed as the training provider. Edinburgh College has been working with the project to deliver a number of seminars and practical training days on historic building repair and restoration techniques. 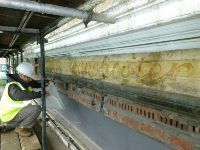 These have been looking at the appropriate materials and techniques to use to repair historic buildings with traditional materials to match existing, i.e. 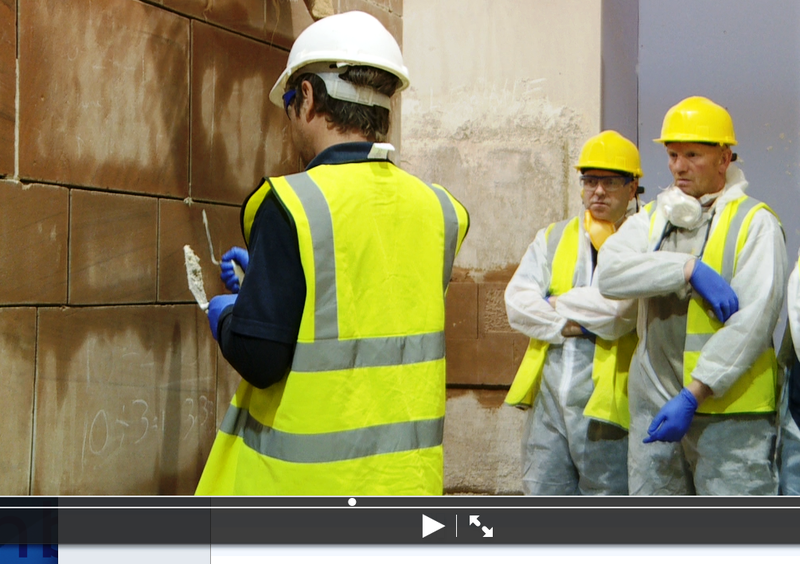 natural stone, slate, lime mortars and renders, sash and case window repairs and the restoration of traditional shop fronts.Three sets of training courses have now been delivered,(Sept 2011-Nov 2011 , Sept 2012 -Nov 2012 and Sept2013-Oct 2013) together with practical work experience in Dalkeith.40 trainees underwent the training.See attached training plan brochure giving details of the free courses. 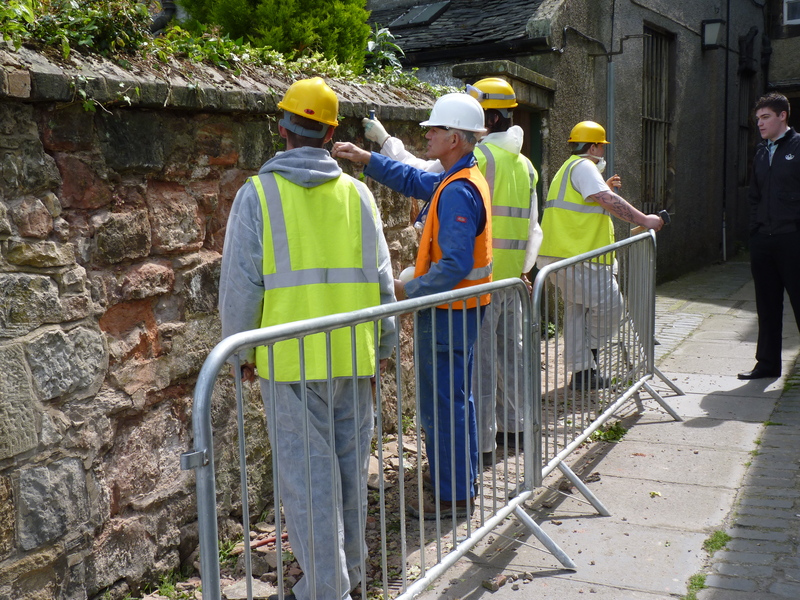 A special course aimed at schools is also part of the training plan and pupils at St David's RC HIgh School at Dalkeith Campus undertook the 5 week , one day a week schools heritage skills awareness course in June 2012. The wider local community, residents and schools/colleges. The free workshops will be this time complimented by on site mentoring. This will be a "live" site at the rear of 87-89 High Street in Dalkeith where the trainees can practice the skills they have learnt in the workshops.Johnston builders have been appointed to assist with the training together with Edinburgh College and Midlothian Traing Services. The site at the rear of the High Street faces onto to a public car park at the rear and is in a poor state. 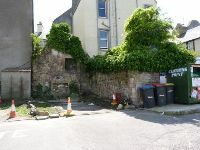 It is the remains of an old stone building that used to be part of the Closes at the rear , with the end gable and one side stone wall remaining.The repair/consolidation work will involve the removal of the vegetation , repairing and repointing the walls in lime mortar with a new stone coping and laying granite setts on the ground to replace rotten timber planks. 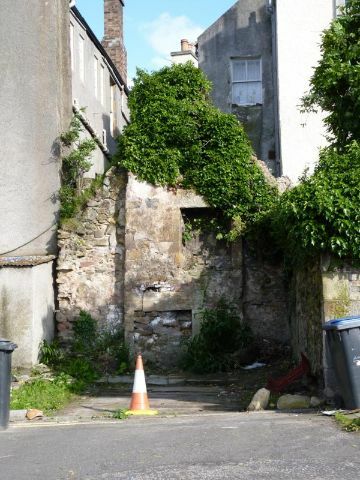 Photos of the rear of 87-89 High Streeet Dalkeith , on site training opportunity . Doors Open Day September 14th 2013 and next set of free training courses at Edinburgh College. 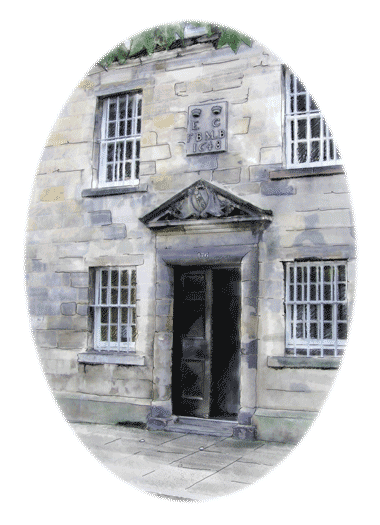 For Doors Open Day this year the Dalkeith THi exhibition will be set up in the Corn Exchange , in Dalkeith again and edinburgh College will be demonstraing traditional building skills, ie roofing , stone masonry , plastering and sash and case window repair. Free Home Owners Seminar..22nd May 2013 at Dalkeith Arts Centre , 5.30pm to 7,30pm. 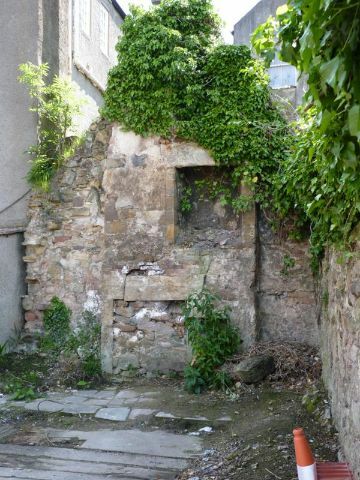 In order to assist historic building owners in Midlothian a free seminar has been organised by the Dalkeith THI/CARS project and Jo Parry from Hypostyle Architects . The seminar will commence with some brief presentations by key speakers about the need to carry out timely and careful maintenance and repair to historic buildings to avoid costly bills in the long run. This will be followed by break out sessions where experts will be available to give home owners advice and guidance on aspects of traditional building repair and maintenance , ie stone masons , joiners , architects , quantity surveyors etc. The key speakers are Jo Parry , Rod Lugg , John McKenny (National Federation of Roofing Contractors),Alex Stark(Stone Federation),John Laing(Edinburgh College), Ali Davey(Historic Scotland),Simon Roberts (Scottish Goverment). Click on here for invite flyer download. There will also be professionals available to give advice who have been involved the Dalkeith THI/CARS . We have Stewart Insker from The Edinburgh Stone Masons, Kevin Bunyan from Holyrood Contracts (traditional sash and case window manufacturers). A new home owners leaflet will be available as well as a DVD . National Progression Award in Stone Masonry . This is now being delivered at Edinburgh College, Granton Road Campus as part of the Dalkeith THI/CARS Training Plan . 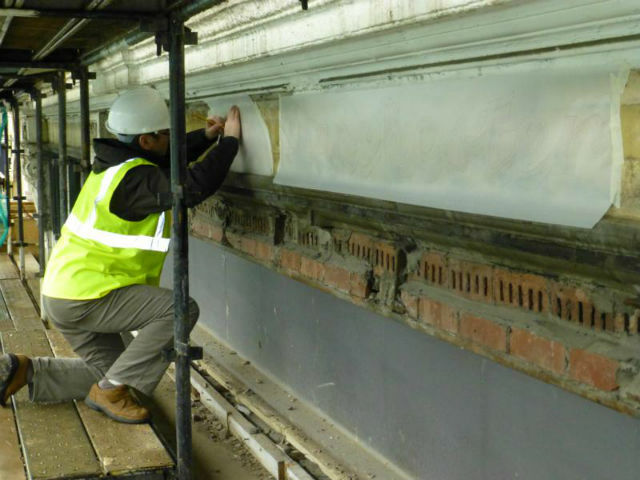 This is a 6 week full time course aimed at providing trainees with a nationally recognised qualification that can them assist them gain the necessary conservation skills to find employment in the construction industry, specialising in the repair and restoration of historic buildings. In order to assist owners of historic buildings address repair and maintenance issues a relaunch of the Dalkeith Home Owners Repair and Maintence Guide is being planned together with a new leaflet and DVD.It is envisaged that this will take place in mid May with a number of presentations, a chance for owners to meet with building professionals and contractors to gain advice and to look at a number of exhibitions. Following on from the launch will be a number of free home owner workshops and seminars, dates yet to be arranged. The next phase of FREE training courses at Edinburgh College, Granton Road Campus. Leadwork.................................................Time yet to be arranged.. Homeowners seminars will be arranged again for the spring 2014. Address: 11 South Street, Dalkeith EH22 1AH. moblie no 07545551356. Address: Edinburgh College, 350 west Granton Road, Edinburgh, EH5 1QE. mobile no: 07803 277674. 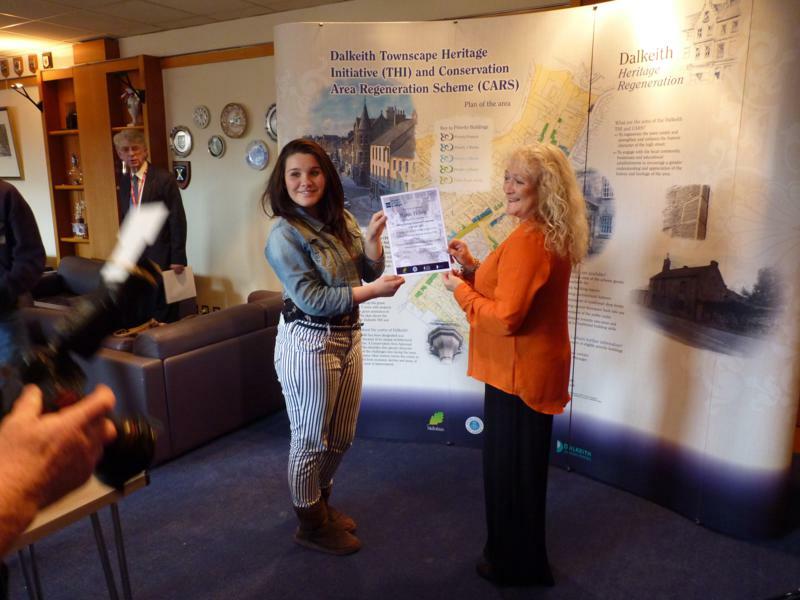 As part of the wider education and training programme , involvement of the local community is key in promoting an awareness and understanding of Dalkeith's unique history and heritage. Dalkeith History Society and the Dalkeith Heritage Trail Working Group have been involved in assisting with the recording of historic details on some of the grant aided schemes. 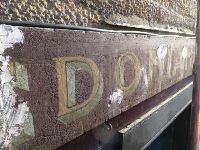 Tracing and photographing the orginal hand painted sign, " Caledonian Laundry", at no 8 High Street , Boom Barbers shop which was also discovered under the modern shopfront. 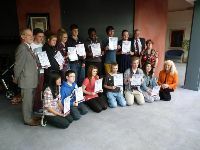 Pupils at St David's RC High School in Dalkeith have recently completed the 5 week heritage skills awareness course delivered by Telford College and the Dalkeith THI/CARS. 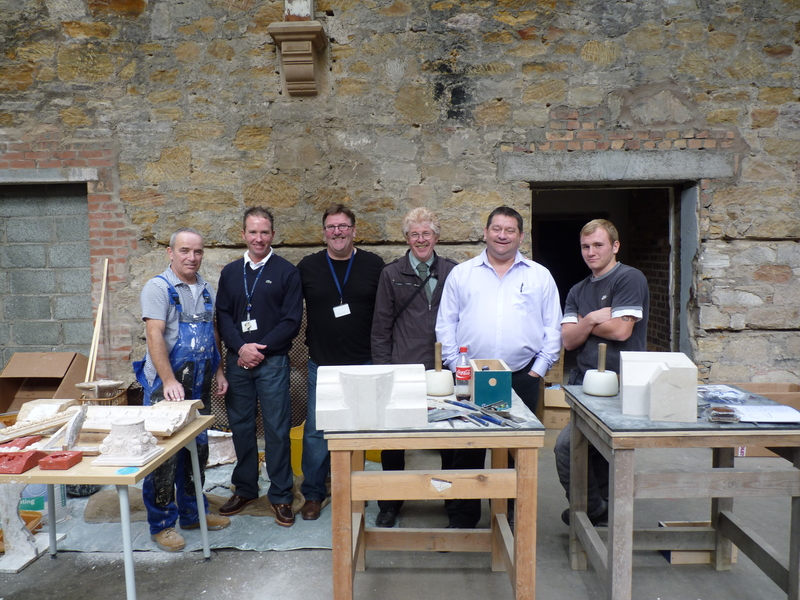 Stone carving, marbling and graining, plaster moulding and picture framing and were able to visit some key historic buildings, ie St Mary's Cathedral in Edinburgh and Rosslyn Chapel to talk to stone masons and other craftsmen about the history and care of historic buildings. Pupil's learning about plaster moulding and having a go!! Marie Howie, Chantelle Muldoon, Bianka Paculanang (most promising student), Ryan Dyer, Ryan Mackay, Samuel Grainger, Amy Bonnar, Jodie Sullivan, Chris Laird, Adele Walters, Ricci Hudson-Storey, Kumbi Muzangaza (most promising student) and Ciaran McHale. Well done to all. Some of their work was displayed at the presentation ceremony and it was clear that they enjoyed the course and were able to demonstrate some creative skills !! As part of the repair and restoration grant aided work to the Tolbooth an archaeological investigation has to be carried out as this is a Grade A listed building. The investigation will assist with the understanding of the building's history and how it has changed over time. Tom Addeyman is the Archaeologist who has been appointed to carry out this work and is starting to discover how the building has been altered over the years. 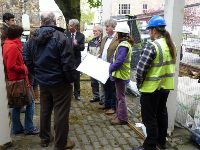 Two training events have been held with the archaeologist talking about and demonstrating the methods used to investigate the building and a couple of trainees were given the opportunity to assist with the recording work. A group of about 15 people were able to participate, members of the Dalkeith THI/CARS Project Team, the Dalkeith History Society, some Midlothian Training Services trainees and students from Edinburgh College of Art. It is anticipated that there will be a follow up session when more information will be available about the building's history. 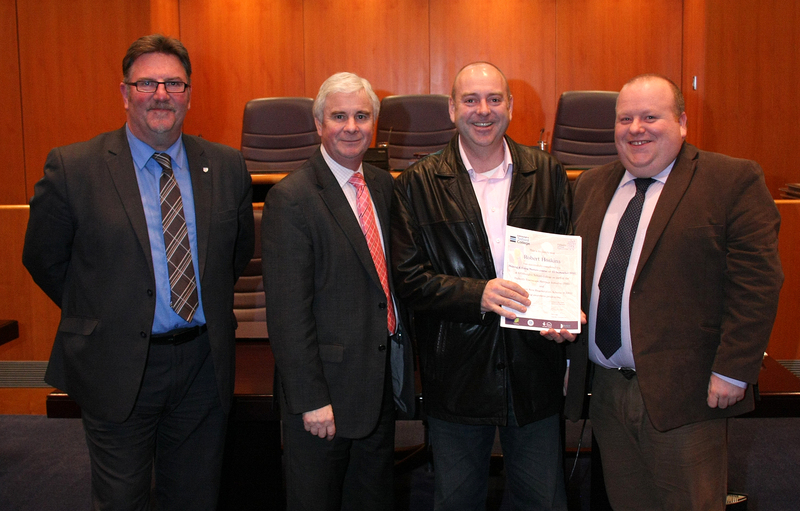 The Training Pan for the Dalkeith THI/CARS was officially launched at Midlothian's Council Chamber on 29th June 2011. 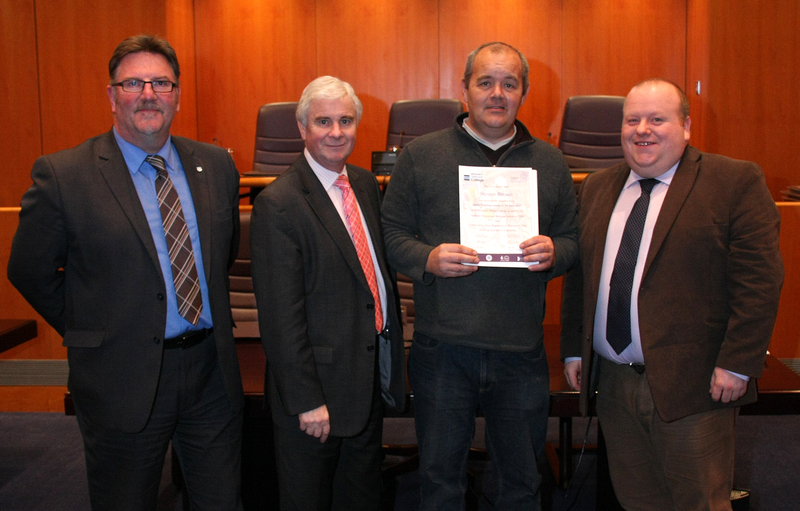 Edinburgh's Telford College together with the Dalkeith THI/CARS will be delivering the plan over the next 2/3 years. 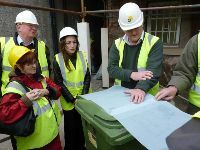 The first two phases of the workshops have been held at Telford College for Midlothian Training Services Trainees and supervisors, building professionals and contractors. These proved to be very successful and a presentation ceremony was held to present the trainees with their well earned certificates. 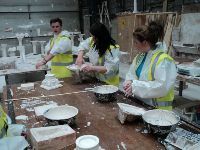 Further phases at the workshops at Telford College are planned for September/October and November 2012. These are planned for contractors, builders and building professionals together with home owners. 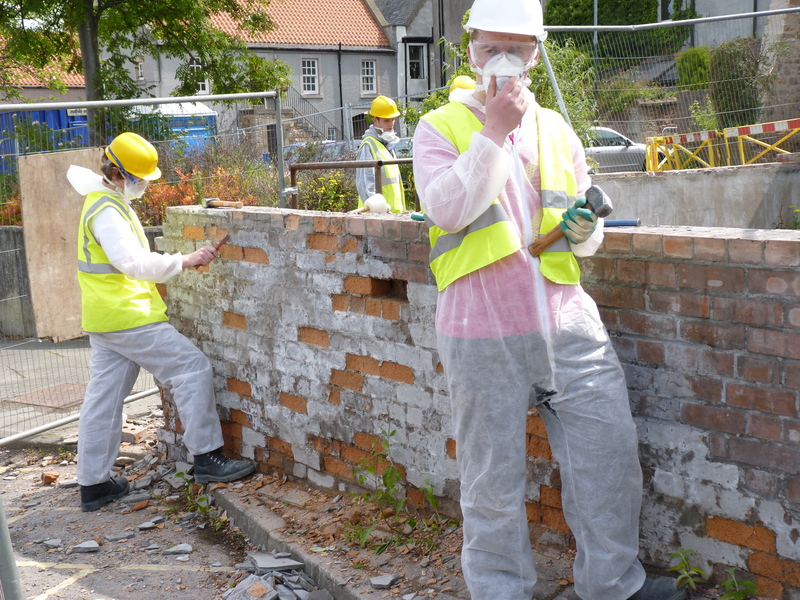 The practical workshop sessions will take place at the College with some on site practical experience in Dalkeith on one of the building grant projects. The courses are set out in the Training Plan Brochure. All these training courses are free of charge and funded through the Dalkeith THI/CARS scheme. To register your interest in any of these courses and for further details please contact the THI/CARS Project Manager. 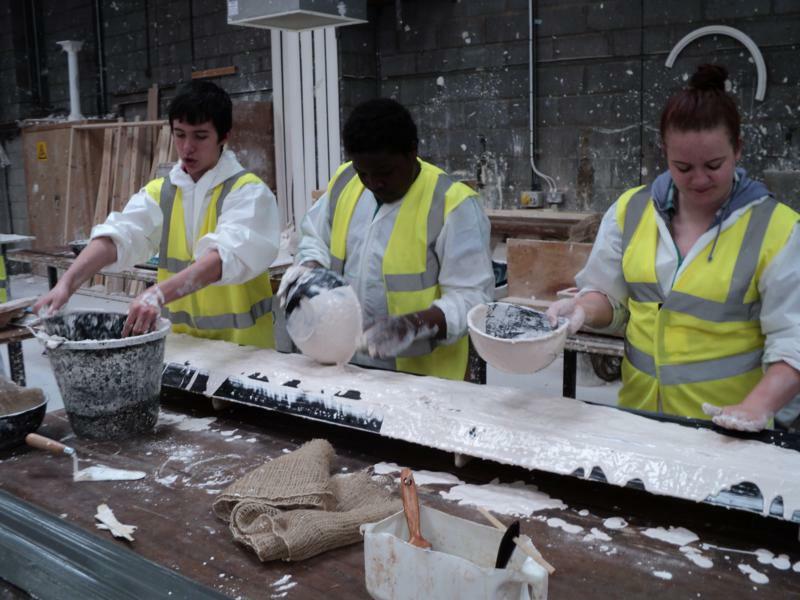 Certificates will be issued for attendance and also attendance can lead to the National Progression Award for stone masonry, a nationally recognised qualification. 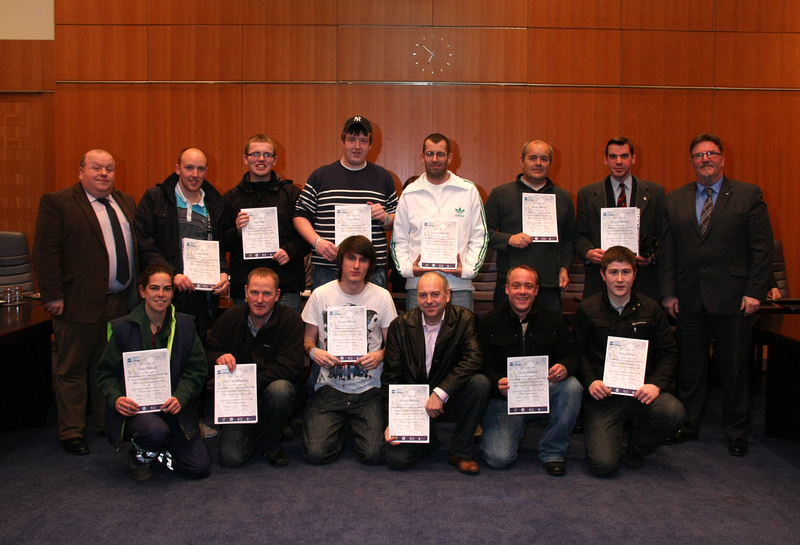 The first home owners seminars were held on the 11th and 18th October 2011. Further seminars will be held in the spring of 2012, so please keep an eye on the website to check the dates for these. The seminars are aimed at owners and tenants of historic buildings. 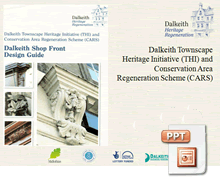 The Dalkeith THI/CARS Home Owners Guide is available as a download on the Website. There will also be homeowners practical workshop sessions at Telford College in Edinburgh, please see the training brochure. 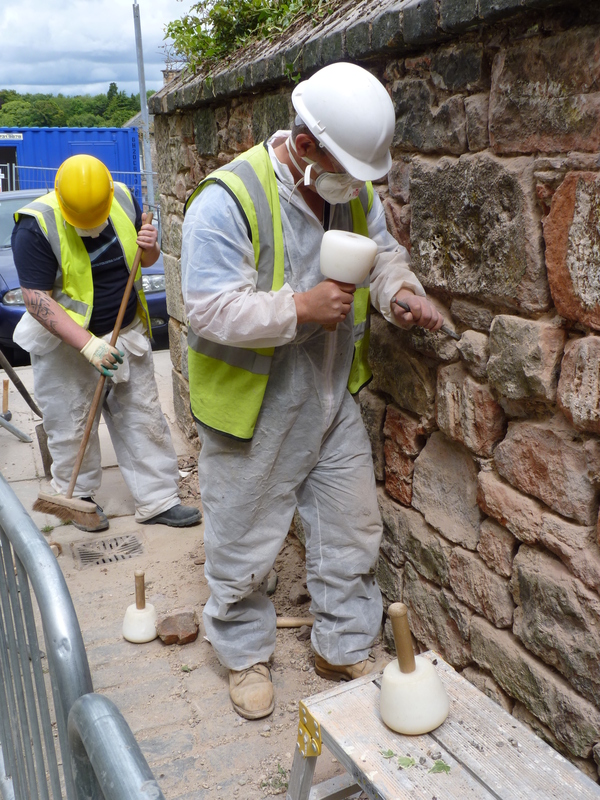 Trainees working in the Vennels in Dalkeith repairing stone and brick boundary walls using lime mortar and lime render as part of phase one of the training plan . An important part of the training plan is sharing best practice in this country and aboard. 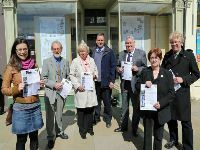 The Dalkeith THI/CARS assisted in showing a delegation from Lithuanian how the town centre was being regenerated through the grant scheme. 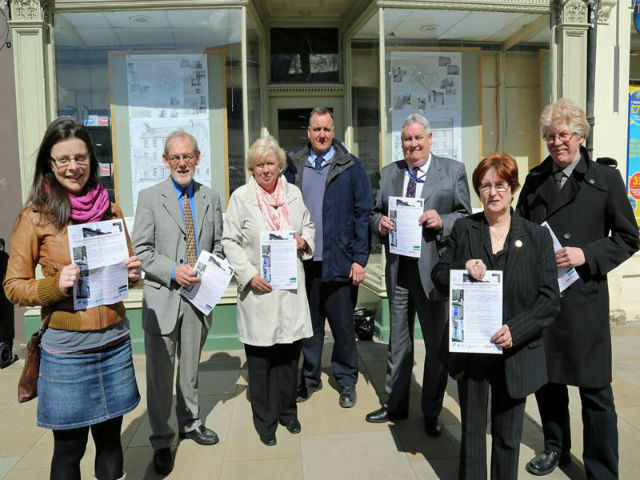 Officials from the municipality of Ukmerge met with Councillors and officers from Midlothian Council, Dalkeith Business Renewal and the THI/CARS project on the 14th December 2011. Rima Boskeviciene the Head of investment and foreign affairs, Rolandas Janickas from the Chamber of Commerce and Viktorija Zilinskaite, a businesswoman who lives in Glasgow met with Councillors Margot Russell, Russell Imrie and Alex Bennett, Ann Coveney from Dalkeith Business Renewal, Elaine Richardson Conservation Officer at Midolthian Council, Kenneth Ferguson a local surveyor and Rod Lugg THI/CARS Project Manager, to look at what was happening in Dalkeith and to discuss possible links with Lithuanian in terms of grants and shared learning and training. It was agreed that links would be developed and forth coming projects discussed to see where shared experience would be useful.